Get your message out there where the rubber meets the road! CNY Mobile Billboards is a locally owned Syracuse company with the mission of positioning your message when and where it will be most effective. We offer a wide variety of mobile solutions that will fit your budget and objectives. Mobile billboards can bring any message or advertisement to hard-to-hit locations and will deliver immediate, overwhelming and targeted results. The great advantage to mobile billboards is that they are invasive, mobile and they garner unsurpassed attention. Take your message to those areas where traditional billboards are unavailable or just simply not allowed. Advertise on mobile billboards at special events like conventions, festivals, fairs and concerts. Reach people during their daily commutes to and from work, to school, the grocery store …anywhere their travels take them your message will be readily absorbed. Campaigns can be run in conjunction with your special or ongoing promotions. Our mobile billboards are big! Measuring 10′ x 20′, these large mobile billboards are built to roam and be seen. Our team will work with you to build the perfect route to meet your strategy. Whether dominating busy downtown streets or driving the highway during rush hour our mobile billboards get attention. Campaigns are scheduled by the hour, day, week or month. Dual panels, single panels, or half panels are available. Your billboard is fully lit so it really stands out at night. 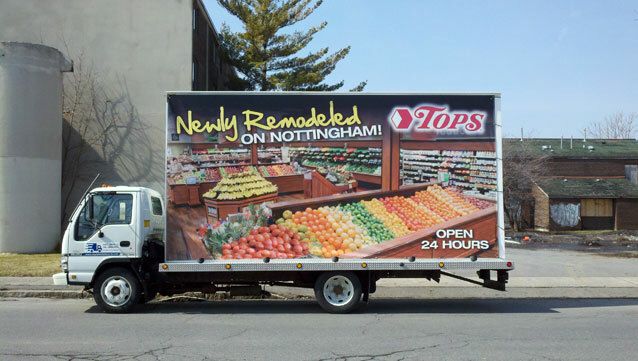 Full color graphics are on heavy duty re-usable vinyl. Our scrolling truck allows us to partner non-competing businesses together while on the road and during high profile events like the NY State Fair, NY State Nationals Week, and many more. The motorized display simply rotates from one billboard to the next. Research shows that consumers stay tuned to see what billboard pops up next. Our plexi-view truck has bright interior lighting can serve as an all weather display and central hub for a street scene. The fixed position trailer solution is an economical solution and perfect for grand openings, special events and festivals. It is a mobile billboard we deliver to you and park in your lot. The trailer has AC powered flood lights to keep your message seen 24/7. Our CNY Mobile Street Team is a group of enthusiastic people to help spread the word about your company, product, event or service. Let them hand out your fliers, product catalogs, brochures or promotional items. They can even hand out product samples and demonstrations. Street teams can be as few as two or as many as twenty or more. Best of all we take care of the street team coordination and deployment. We can do it all. From planning your route and overall strategy to designing and producing the artwork for your CNY Mobile Billboard campaign.